The Weekly Walk: Is Halloween Really Over? How did you celebrate Halloween? Did you trick-or-treat with your pet? Watch movies with your cats? Host a small party at your home and bake dog treats? Teach your dog to play dead in the front yard and frighten passerby by rising from the dead? We would love if you shared your photos and stories with us. To see what else went on around the country, below are a few of the parades that celebrated Halloween and pets. This year in Boston, owners and their pets dressed up and walked the Charles River Esplanade. You can view photos of everyone dressed up, as well as the winners of the costume contest. We would have definitely voted for the small Where’s Waldo group that you can see at the bottom of the article. 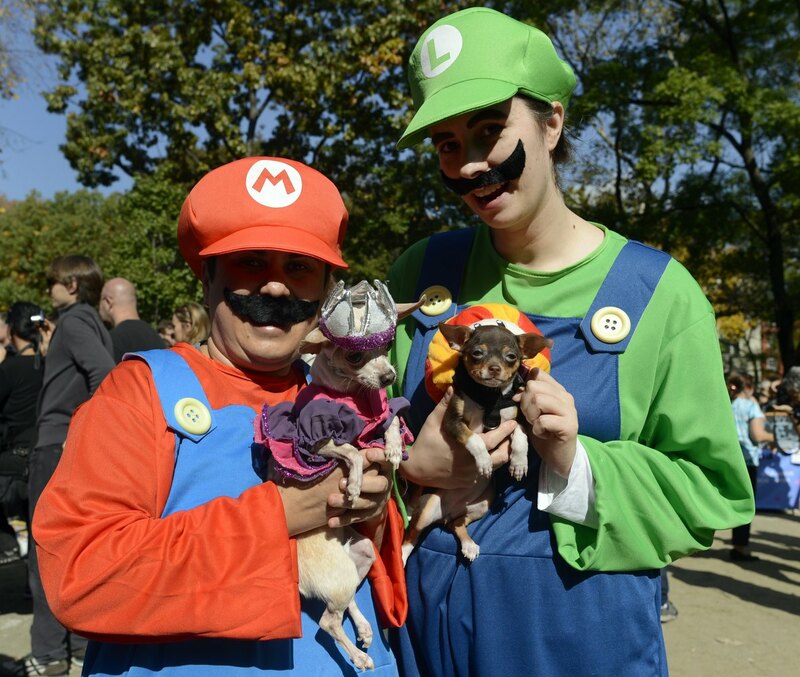 Chicago had its 10th annual Tails in the City Halloween Pet Parade. See a Dorothy dog, a furry prescription pill bottle, barking pirates, even Underdog! Q: What are skeletons afraid of? Trust us, your pets still like the treat part of Halloween. Try these two recipes with them. Hint: two words, last week’s post, singular. Halloween doesn’t make spiders scary. Spiders make spiders scary. Thankfully we have cats to deal/play with them. Simon’s Cat handles this creepy-crawly. We hope you enjoyed Halloween this year! Share pictures and tales (or tails) below, on Twitter, or Facebook. Woof! Article of the Week: Lock Your Doors! You can also spend the night online looking at pets wearing costumes. Halloween is about scaring people. Boo! Rah! Gah! Bark! Some dogs love to participate in the spookiness and join packs of other costume-wearing pooches, but not every fido enjoys crowds of strangely dressed animals and humans. If your pooch would rather close the curtains and wait for the faux-monsters to skedaddle, here are a few ideas for spending the night with them. Create your own event: Invite over a few friends with familiar dogs for an even of socializing. Wearing costumes can be optional but should be discussed before the party. Bake treats: Your dog may not enjoy the trick part of Halloween, but we are certain she enjoys the treat part. Rather than getting candy or dog biscuits from strangers, consider making your own. You can even decorate them and cut them into festive shapes. This might be a fun activity for the small party you host. Watch Halloween movies: A comfy night on the couch with your dog and holiday movies with dogs in them. A night well spent. We shared a list of Halloween movies last year, which you can view here. Forget Halloween ever happened: Does the entire idea of Halloween just sound exhausting? Are you and your dog unamused by the idea of ghosts and goblins? Then you might want to ignore the holiday by decorating for Thanksgiving or putting on Christmas music or both! Scary nights are not for everyone, so if you feel the need to sing or bark “Jingle Bells” this Halloween, we won’t judge you. Q: What type of dog does Dracula own? To help with your intimate Halloween party, here is a recipe for homemade Halloween dog biscuits. Hint: two words, fearful feline. Pugs just lend themselves to costumes. Click the photo to see more from BuzzFeed. Hurry! 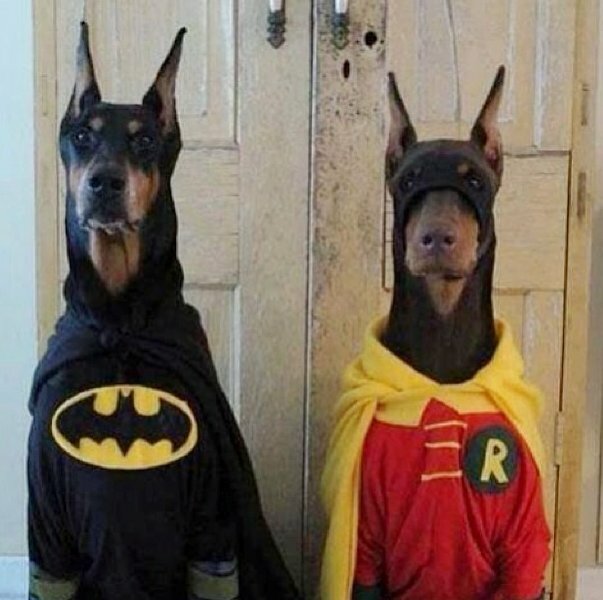 Time’s almost up to win $25,000 by entering Petco’s Pet Costume Photo Contest! Have a safe and happy Halloween! Share photos or stories from the holiday below, on Twitter, or Facebook. Woof! You might want to bring a flashlight on our Weekly Walk today. It will be a dark stroll with furry things lurking in the shadows, things that may sniff you, things that may lick your hands. The horror! The woof! Halloween parties with your pets can be a great way to socialize with other pets and their owners, but crowded spaces are not for every animal. If your pets get anxious around others, consider relaxing in front of a festive movie with them. Below is a short list of holiday films. Click each title to view trailers. It’s the Great Pumpkin, Charlie Brown: (Snoopy, Snoopy, Snoopy) Charlie Brown and the other Peanuts celebrate Halloween (Snoopy, Snoopy, Snoopy), while Linus awaits the arrival of the Great Pumpkin (Snoopy, Snoopy, Snoopy, Snoopy, Snoopy). Wallace and Gromit in The Curse of the Were-Rabbit: This inseparable owner and pet duo are determined to learn who is ravaging gardens in their town. The Nightmare Before Christmas: What do you get when you combine Halloween and Christmas? An awesome movie that involves memorable characters, like a ghost dog named Zero. Frankenweenie: Tim Burton’s original and touching 1984 conception of a boy resurrecting his four-legged friend. Corpse Bride: A third Burton film, this one with a man marrying a deceased woman. And there’s a skeleton dog! There’s been some troubling news in the world of Obie. His caretaker Nora posted that the shelter he came from wants him back, and she has been ordered to meet them in court. You can read her message on Facebook. We wish only the best for the inspirational canine. It’s Alive! : If you can teach your dog to howl when you say this, he’s ready for a Frankenstein’s-monster costume. “Rip” goes the pet costume if it’s uncomfortable for your pet. Are you participating in Halloween activities with your pet this year? Click the photo to see pictures of costumed dogs from the New York Halloween parade in Tompkins Square Park. 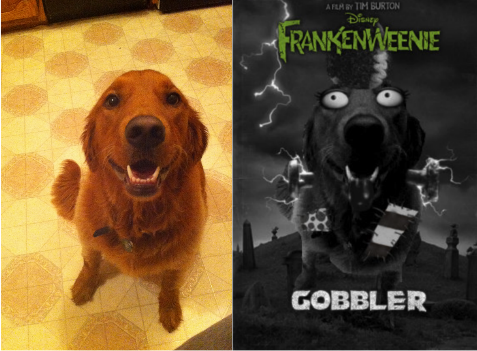 Brandy “Frankenweenie-fied” has become the Gobbler! We posted this two weeks ago, but it’s too appropriate for the season not to share again. If you want to dress up your pets without actually putting them in costumes, head over to the Frankenweenie Facebook page to “Frankenweenie-fy” your pet. You’ll need to upload a photo of your friend from your desktop or Facebook, or you’ll need to take a photo with your computer camera. Click this link and follow the onscreen prompts to start “Frankenweenie-fying” your pooch. Thank you for braving the dark with us on this Weekly Walk. Let us know if you do anything festive for the spooky holiday here, on Facebook, or Twitter. Woof!